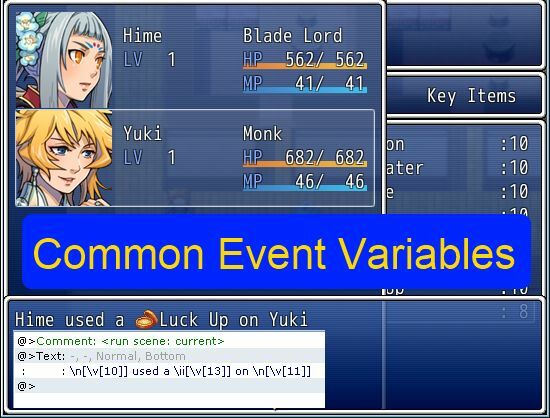 This script automatically updates a set of “common event variables” throughout the game. The purpose is to make it easier for developers to design events that rely on information such as who used a skill. The main purpose of this script is to provide a way to specify common event arguments. These arguments are stored in game variables, which makes it easy to use for the event editor and some script calls when necessary. The variables will be updated automatically whenever a skill or item is used, on the map or in a battle. $game_temp.common_event_item   - stores the item used. You can access them in your common event script calls as needed. All values are nil if no data is available. Note that the skill and item are stored in separate variables. You can reference these variables in your events or script calls. HI Hime! I’m using this script, but i can’t get it to check the class id of the user of an item that runs a common variable. But they didn’t worked. Does this script checks for the actor’s class id? Where $game_variables[X] is the variable that you set as the “User_Variable” in the script’s settings. ($game_temp.clear_common_event_variables unless $game_temp.common_event_reserved?) be safely commented out? It appears to be conflicting with some other script I’m using, seemingly clearing out the data too soon, before it can even be used, but apparently it works fine if I remove this line (or with the line intact, but in a clean project). Hey Symbol. I ask to you cuz looks that you know about this and cuz hime looks to not be responding to this page anymore. Maybe you can help me with this. I can’t make that the branch do something when the actor use an skill. What I want to do is that: when an actor use an skill, a picture of their face shows. Now, I make in the skills that I want this to happend, that the common event “User Skills” call. Now in the common event “User Skills”, I made a Branch where when the variable 10 is = to 1, the picture of actor 1 appear. Hello! Unfortunately, I don’t think I can help you with just the information that you provided. It would probably be best to ask on the RPG Maker forums, and include a screenshot of your common event. Feel free to message me with a link to your thread (I have the same nickname on the forum as here – SymbolsWriter), and I’ll see if I can help you if no one else does it first. Hime, I have a question. How can I use this to pull specific stats? The gist of what I want to do is use the variables of who the user and target are in order to allow the common event to find out what they have in a stat. For example, using this so the common event can find the atk of the user and def of the target. To get the user's ATK and target's DEF respectively. Thank you so much! Your scripts help me immensely with my project, and your help is even better. No matter how I try, I cant find a proper way to make it work in my project. I want to show specific text when player casts skill on specific enemy. Let’s say if enemy with ID 001 is target, show text after using skill “Enemy 1”, if Enemy with ID 002 is target, show “Enemy 2”, etc. I tested on empty project – still no luck. I added common event in Attack skill, then in first common event I added conditional branch with script $game_temp.common_event_target == 1 and show text “Enemy 1”. I never get that text in the battle when using skill on Enemy ID 001. Note that this the target MUST be an enemy in this case. If it is an actor it will crash. Now it works perfectly! Thank You! Thanks for your great works but I think the download link is broken. How can I get that? It seems it is fixed. Thank you! “Script ‘Game_Interpreter’ line 450: NoMethodError occurred. Have you tried this in a new project? Did you set up your variables correctly? I just tried this in a clean project by inserting a common event in the Attack skill, and then using it. In that common event was a conditional branch that said $game_temp.common_event_target = 1, and if it did, display a message. When testing it, he same NoMethodError from before showed up. And I did set up my variables correctly. You need to use == to check for equality. = is assignment. Well, that fixed that error. It’s still returning zero, though, no matter what, variable or through $game_temp.common_event_target. Yes, I can’t change it otherwise it would not be compatible with the event system since they assume 0-based indexing.